You can buy a humane rat trap that will capture the rat. You can drive it at least two miles away and let it go. Make sure all entrances to your home from the outside are secure. Using poisons is discouraged because the rats will die inside your wall and create an awful odor. Poisons are also not safe to use in homes with children or other animals. Use bleach when cleaning areas where the rats have been. Be extremely cautious when setting up your rat trap. Rats are dangerous creatures for several reasons. They get into your food, eat electrical wires and start fires, and carry diseases. 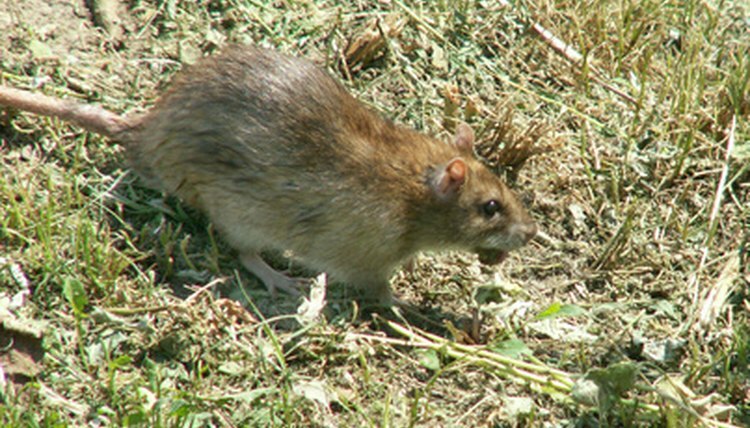 It is important to get rid of any rats you find in your home as soon as possible. Buy a snap trap, a large wooden trap that has a metal mechanism that will spring on the rat when it grabs the food placed on it. Place some bait on the trap. Peanut butter works well, but you also can use a piece of apple or bacon. Set the trap by moving the metal bar all the way back and attaching it to the metal hook. Place the trap where you have seen evidence of the rat. Make sure this placement is out of the reach of children. Dispose of the rat carefully and properly after your rat has been caught. Wear plastic gloves to protect yourself against any diseases and pick the rat out of the trap with some newspaper. Roll the rat up in the newspaper and seal it in a large freezer bag with a zipper. Throw the rat away in a trash can with a secure lid. Wash your hands with antibacterial soap.